Findable on the downloads page, for the morbidly curious. 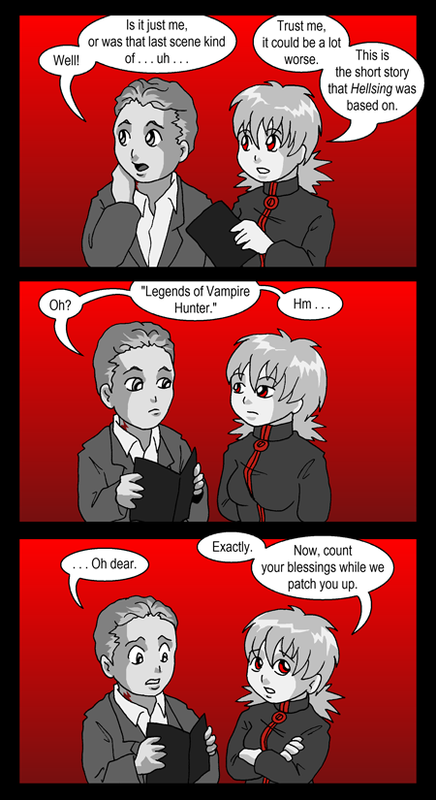 Seras: Trust me, it could be a lot worse. This is the short story that Hellsing was based on. Seras: Exactly. Now, count your blessings while we patch you up. Penwood: Who’s this Reggie fellow? Can we call him? Bertie: That’s it! We’ll call for help! I knew I would think of something! Stretch out your empathetic awareness. We’re looking for someone in the area, willing and able to come to our lady knight’s aid.